Assuming on the average that a person lives for 80 years, the typical person spends more than 26 years sleeping. When we don’t get enough sleep, our reactions times slow down, our blood pressure rises, we increase the chances that we will develop obesity and diabetes, and we become less productive. In the following image you can see [that] as you lose focus and your attention is drifting, the yellow bits show how people with enough sleep activate parts in their brain to refocus at the task at hand. 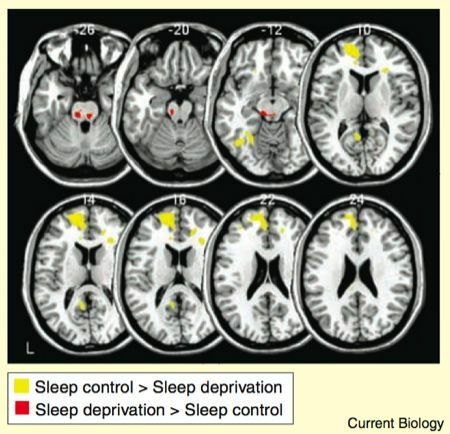 Sleep deprived people will have barely any activity in that area (the amygdala reactivity) and will struggle to regain focus. After reading Leo’s post, I wondered whether my alarm’s snooze button helped or hurt my productivity. On some days, I get up as soon as the alarm rings. But there are days when the snooze button and I become close friends. Here’s a wonderful short video explaining why you should avoid using your snooze button – and why it’s important, if you want to stay productive, for you to get out of bed as soon as your alarm rings. Do you agree? Does your alarm’s snooze button help or hurt your productivity?